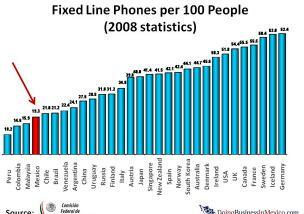 Mexico has a deficient coverage of fixed line phones in comparison with other countries with similar economic development. Inflation topped 10 year record! Is China still sucking away Mexico´s jobs? One of the two mayor Mexican airlines has suspended operations in Mexico. The partner airlines of Mexicana Click and Mexicana Link are still in business. The Mexican Central Bank reported a historic record on accumulation of US$94,470 millions of international reserves at the end of February; this figure has grown more than 6 billion dollars since the beginning of the year. The Inflation Rate experienced in the month of January showed a significant increase compared to the previous years. This resulted from price increases on public transport, telecommunications rates and prices rise affected by the tax increases for 2010. It seems that the tendency is close to turn around. With wages on the rise in China, and the economic stabilization experienced in the last decade in Mexico, the distance in terms of average wage per hour has moved from a 237.9% in 2001 to an estimated of 13.8% in 2010. As a result of the world economic crisis, the Mexican unemployment rate has stabilized in the band between 5.5% and 6.0%. This means that the economic downturn has resulted in a 2 points loss compared to the band experienced before the crisis (between 3.5% and 4%).